Paducah’s newest tea and coffee shop is blending an English aesthetic with some American ingenuity and the results are simply delicious. For Peter and Amber Barnett, business and passion are brewed from a cup of Earl Grey tea. The couple owns Pipers Tea and Coffee, a new Paducah coffeehouse. The shop opened in the city’s former Coca Cola plant in April, and they began offering various coffees and 35 different teas to local clientele. “I wanted a really cool coffee shop that could do really good drinks,” Peter says, putting his ambitions simply. Peter, a native of York, England, says he has worked as a barista on four continents, and he has used his varied experience to craft Pipers’ menu. The coffeehouse offers beverages such as “pour over coffee,” in which the drink is made by slowly pouring hot water in a circular motion over a filter full of coffee grounds as liquid drips into a cup below. Pipers’ baristas make the tea in a similar fashion. That includes the very distinct Earl Grey—the drink that kick-started the whole business. The Barnetts moved to Kentucky four years ago to live closer to Amber’s family. After getting used to daily cups of Earl Grey, they say they couldn’t find a brand they liked in America, so they started making their own.They blended Earl Grey tea leaves with Silver Needle White tea leaf tips and Sicilian bergamot oil. “I really worked hard, just for me, to come up with an amazing tea where we’re blending it together with ridiculously high-quality stuff,” Peter says. Thus, the couple put their own stamp on a British tradition. Inspired, Peter and Amber began researching other teas and using family contacts to find farmers all over the world producing high quality leaves. They started experimenting with blends and becoming increasingly passionate about the history of tea. After developing several products, the Barnetts began selling Pipers Tea online in 2014. Amber says the two partnered with local businesses such as Midtown Market, creating special tea blends just for them. The merchandise sold so well the Barnetts began eyeing a space in Paducah’s old Coca Cola plant for a brick and mortar outlet, through which they could also make use of Peter’s coffee expertise. And so,in January, they partnered with Jessica Strenge at Paducah Coffee Company and began preparing for what is now Pipers Tea and Coffee shop. When the Barnetts designed the shop, they wanted to create a business that embraced Paducah’s unique community. The result, Peter says, is a coffeehouse that showcases bits and pieces of Paducah’s culture and craftsmanship. Contractor Rob Hall built the wooden countertops and tables that stand out against Pipers’ white walls. Images from Paducah photographer Glenn Hall, the coffeehouse’s first featured artist, decorate an entire room. Barista Grace Yocum even contributes to the shop’s atmosphere by composing poems each week and scrawling them across a chalkboard in the back. Baker Mary Remy, of Little Feasties, supplies the business with salted caramel cookies, brownies and more, and Paducah Coffee Company provides Piper’s with beans roasted so well they satisfy Peter’s discerning tastes. “There’s a collaborative effect to the whole thing—bringing everybody together, doing what they love, bringing it into the same environment to show love and care and dedication,” Peter says. And in the center of this collaboration, the Barnetts and their barista team caffeinate the public. The smell of Turkish coffee wafts through the coffee shop’s three rooms as people sit by Piper’s spacious windows and watch the cars drive by. 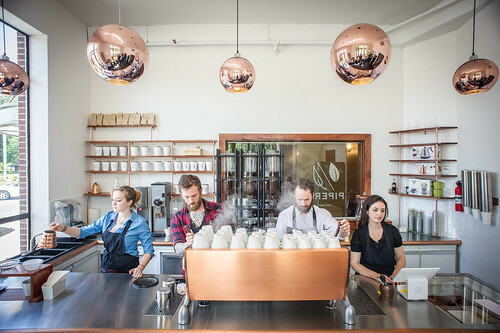 While customers sit and talk, work, or gaze at traffic, Peter hopes they sip something new. That adventurous spirit is one of the characteristics he loves most about Americans. Peter says he can’t take his Earl Grey to England because the British don’t like to stray from their traditional tastes. 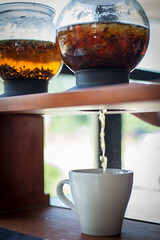 At Pipers, however, the Earl Grey is barista Bobby Dowell’s black tea of choice.